Whether you’re an adult or a teenager, straightening your teeth with Invisalign is a great way to correct your smile and feel better about yourself, without the discomfort and unsightly appearance of traditional braces. To see if Invisalign is the right orthodontic option for your smile and your budget, schedule a consultation with Dr. Fischl or Dr. Marie Bradley Fischl at Fischl Dental Associates today! Choosing to straighten your teeth is a big decision that affects not only your appearance, but your lifestyle as well. As an adult, you may be looking to improve on your smile for business or social reasons. Or perhaps you’re a teen or the parent of a teen looking for an effective yet modern-day solution. Either way, Invisalign® and Invisalign Teen® can provide a simple way to accomplish this without having to put your life on hold. Invisalign is a method of orthodontic correction that uses thin, clear “aligners” to gently correct and straighten your teeth. 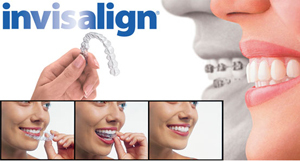 Each aligner is worn for about 2 weeks, for 20-22 hours or longer per day. These virtually invisible aligners shift your teeth gently toward their ideal positions. After you’ve been approved for Invisalign, one of our dentists will take images and scans of your mouth, and develop a personalized treatment program for you. It takes about 4 weeks to manufacture your first set of aligners. Once your aligners are created, your treatment will begin. You’ll come in about every 6 weeks afterward to pick up your next sets of aligners and have a quick oral exam to confirm that your treatment is progressing properly. You’ll wear each aligner for about 2 weeks, and treatment usually takes about 20-24 sets of aligners, so most patients complete the process in under a year. Removable – Invisalign can be removed to chew, drink, play musical instruments, and before playing contact sports. This means there are no food or activity restrictions you need to worry about when using Invisalign. Invisible – Your aligners will be completely invisible to the naked eye, allowing you to get a straighter, more beautiful smile without the unsightly appearance of traditional metal braces. Comfortable and convenient – Invisalign exerts a more even, gentle pressure compared to braces, so there is not as much discomfort during the orthodontic process. Additionally, since you don’t need adjustment appointments every 4-6 weeks, you don’t have to spend nearly as much time in the dentist’s chair. Invisalign® and Fischl Dental Associates take a modern approach to straightening teeth, using a custom-made series of aligners created for you and only you. These aligner trays are made of smooth, comfortable and virtually invisible plastic that you wear over your teeth. Wearing the aligners will gradually and gently shift your teeth into place, based on the exact movements we plan out for you. There are no metal brackets to attach and no wires to tighten. You just pop in a new set of aligners approximately every two weeks, until your treatment is complete. You’ll achieve a great smile with little interference in your daily life. The best part about the whole process is that most people won’t even know you’re straightening your teeth. Ready to get started with Invisalign in Evanston? Come to Fischl Dental Associates today. Dr. Paul or Dr. Marie Bradley Fischl can examine your mouth and determine whether you’re a good candidate. Get the smile you’ve always wanted by scheduling your appointment at (847) 864-0822. You can also stop by our office at 636 Church Street, Suite 200 W, Evanston, IL 60201. We’re always accepting new patients, so we hope to see you soon!